The Trump administration may give ZTE a way out. Last month, the United States blocked ZTE from buying parts from American companies for seven years. The Trump administration said ZTE had broken its agreement to punish employees who violated US sanctions against North Korea and Iran. On Sunday, President Trump signaled the US should reverse the penalty. "President Xi [Jinping] of China, and I, are working together to give massive Chinese phone company, ZTE, a way to get back into business, fast," Trump tweeted on Sunday. "Too many jobs in China lost. Commerce Department has been instructed to get it done!" Ross, speaking at the National Press Club, said ZTE "did do some inappropriate things. They've admitted to that." "The question is: Are there additional remedies to the one we had originally put forward?" he said. "And that's the area we will be exploring very, very promptly." Ross said he wouldn't be surprised if the issue came up during high-level talks this week with Chinese counterparts. Chinese Vice Premier Liu He, the country's top economic official, is visiting Washington this week to continue trade discussions with top administration officials. "Our position has been that's an enforcement action, separate from trade," Ross said, referring to ZTE. But a few hours later, Trump suggested on Twitter that ZTE is indeed about trade. "ZTE, the large Chinese phone company, buys a big percentage of individual parts from U.S. companies," he said. "This is also reflective of the larger trade deal we are negotiating with China and my personal relationship with President Xi." 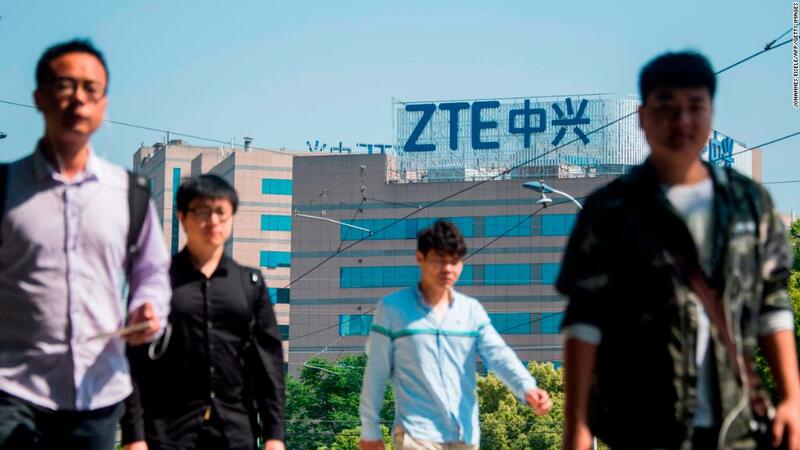 The Trump administration is seeking various concessions from the Chinese government, including removing tariffs on agricultural products, in exchange for easing restrictions on ZTE, according to a Commerce Department official familiar with the discussions. Another possible concession the Chinese could make: removing barriers for US chipmaker Qualcomm to acquire NXP Semiconductors NV — a deal Chinese regulators were holding up, the source said. The official described a possible deal with ZTE as a "confidence building measure," leading up to broader deal with China. But warned that discussions between the two parties are fluid. White House principal deputy press secretary Raj Shah on Monday defended the president's move when asked whether the president was using ZTE as leverage to gain China's cooperation on North Korea. "It's part of, again, the US relationship with China, which is complex. It has economic factors, it has national security factors, this is just one of many factors," Shah told reporters at a briefing. — CNN's Cristina Alesci contributed to this report.